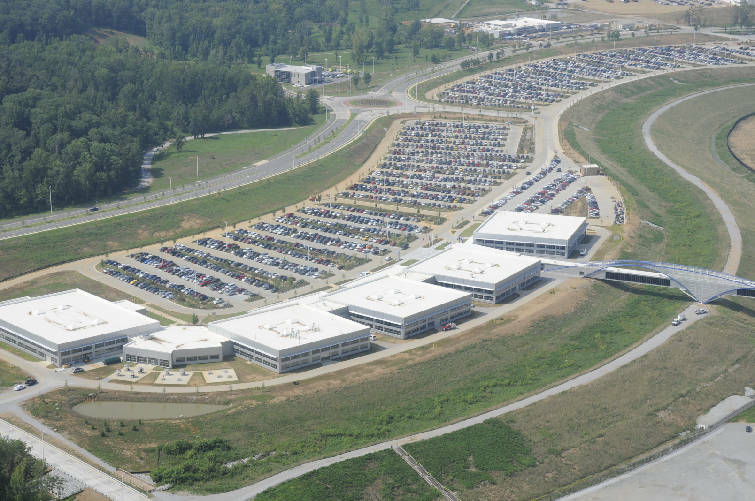 The Volkswagen assembly plant in Chattanooga has been chosen to build a new SUV. • $165.8 million grant from the state of Tennessee for costs associated with site development and preparation, infrastructure, production equipment acquisition and installation, and facility construction. • $ 52.5 million -- Local government assistance to VW, split equally between the city of Chattanooga and Hamilton County, for upfront expenses for the plant addition. VW will pay back $2.5 million in an economic development fee each year for the next 10 years to repay about half of the loan and VW will transfer 300 acres at Enterprise South industrial park back to the city and county. Sources: Tennessee Department of Economic and Community Development, Mayor Andy Berke, Hamilton County Trustee's office. POLL: Will VW's new SUV be successful? Volkswagen plans to invest another $600 million in its Chattanooga assembly plant and hire another 2,000 workers to start making a sports utility vehicle by the end of 2016. More than a third of that investment will initially come from state and local governments who agreed to pump more than $230 million of upfront tax dollars into the project to woo VW into expanding in Chattanooga rather than at its other major North American plant in Puebla, Mexico where labor costs are far lower. Combined with other property tax breaks, TVA incentives, road projects and other potential tax credits, Volkswagen could qualify for more than $300 million of grants, credits and other government assistance over the next decade, Chattanooga Mayor Andy Berke said Monday. Berke said the nearly $300 million incentive package that was leaked to the media earlier this year as part of the negotiations for VW's expansion was based on 1,350 jobs. "Now we have 2,000," Berke said. The latest incentives package comes on top of the $577 million of incentives offered to VW in 2008 from federal, state and local governments to initially convince the German auto maker to build in Chattanooga. The VW incentives are among the most generous government aid ever provided for an automotive plant in the United States. For each full-time job Volkswagen has created so far in Chattanooga, the car maker has received more than $200,000 in credits, grants or infrastructure improvements paid for by government. But if the latest VW investment follows the example of other Tennessee auto plants, the government aid package should pay off for the Volunteer State. Each VW job spurs the creation of even more supplier and spinoff jobs in the region. "We've had three major auto assembly plants come to Tennessee and each one has ended up producing more jobs and income than what was originally projected," said Dr. William Fox, director of the University of Tennessee's Center for Business and Economic Research. "There is really no other business that has as big of an economic multiplier as do automobile plants because they not only directly employ so many workers, usually at above-average wages, but they also lure so many automotive suppliers and those suppliers bring their own secondary and tertiary supply networks." "If you build it, the suppliers come," Fox said. Six years ago today when VW first announced it would build an assembly plant in Chattanooga, Fox projected that the projected 2,000-employee plant would eventually bring 10,000 more jobs to Tennessee through the increased economic activity spurred by the $1 billion plant. A followup study two years ago found that VW's own employment was more than 2,500 and the plant helped create an estimated 12,400 jobs in the Chattanooga region through 17 suppliers and a host of other business created by the extra investment and income in the community. Another 2,000-employee expansion with a whole new vehicle line could spur a similar job gain once again, Fox said. The Chattanooga Area Chamber of Commerce said the new jobs will swell VW's annual payroll in Chattanooga by more than $100 million and the new vehicle line is expected to draw many more automotive suppliers to the region. Tennessee Gov. Bill Haslam said VW "has doubled down on its Chattanooga bet" with its decision to build its "CrossBlue" mid-sized SUV in Chattanooga. With its 200-employee research and development center, Volkswagen also will be working to potentially build other vehicles in Chattanooga in the future, Haslam said. The newest incentive package outlined by the Tennessee Department of Economic and Community Development Monday doesn't include the job and industrial equipment tax credits offered to VW in its initial investment in Chattanooga. But state and local governments are providing more upfront investments to help with the startup of the plant addition. 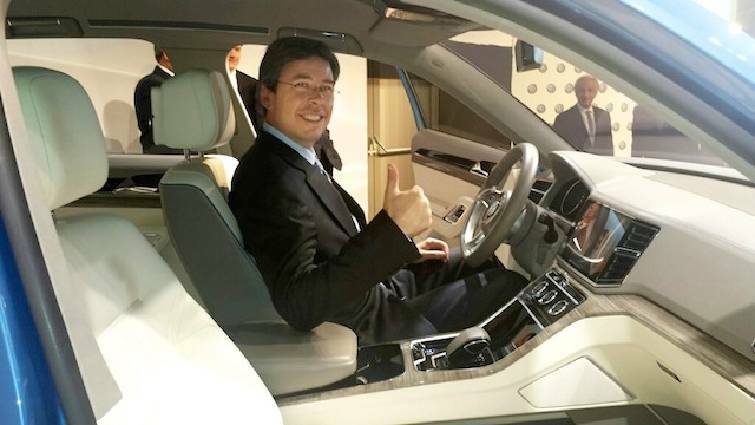 Chattanooga Mayor Andy Berke tries out the driver's seat of the new Volkswagen SUV to be made in Chattanooga. Contributed photo from Andy Berke. Tennessee House Majority Leader Gerald McCormick, R-Chattanooga, said the Legislature will ultimately have to approve the budget for the state incentives and some lawmakers are likely to raise questions about the cost of the government aid, especially since it took nearly a year to negotiate with Volkswagen. According to documents obtains earlier this year by Nashville television station WTVF, Channel 5, the state offered to VW last summer $299.8 million in incentives, including $206.9 million in cash incentives, to bring the SUV line and headquarters or research facility to Chattanooga. That offer was pulled off the table at the end of January when talks stalled and VW agreed to conduct a union certification election for plant employees to vote on whether to join the United Auto Workers Union. McCormick and other state lawmakers said earlier this year that the UAW representation of the VW plant may make in harder to convince the GOP-dominated Legislature to support such all of the VW incentives. In February, VW workers voted 712-626 against joining the UAW, although the union has created a local unit to continue its organizing efforts at VW. "We do need to get out there and sell it to our members because this is a lot of money and members do feel an obligation and responsibility to make sure that tax dollars are wisely spent," McCormick said. "I think it is a good investment and we will convince the Legislature of that because there are just so many ripple effects from this investment that will help so much of our state." Beyond the thousands of new jobs for those hired, McCormick said nearly every Hamilton County homeowner should benefit by an increase in the value of their home as a result of Monday's announcement by VW. Mark Arend, editor of Site Selection magazine, said the Volkswagen expansion is part of the continued Southern migration of automotive production in the United States. "Most of the new assembly plants are in the Southeast and most of them come with some type of incentives package," he said. Contact Dave Flessner at dflessner@timesfreepress.com or Mike Pare at mpare@timesfreepress.com.